It was a matter of time: Sgt. Scott Moore is responding to the online sensation created by actress Mila Kunis accepting his YouTube invitation from Afghanistan to attend his unit’s Marine Corps Birthday Ball. Marine officials said Moore, of 3rd Battalion, 2nd Marines, was unavailable due to operational commitments. However, the public affairs staff at Camp Leatherneck, Afghanistan, released a statement and lengthy question-and-answer session apparently adopted from questions he received from stateside reporters, including me. On Saturday, Kunis, 27, the star of “Black Swan” and other films, accepted Moore’s invitation after she was questioned by a Fox reporter. His video went viral online Friday, one day after it was posted to this blog. 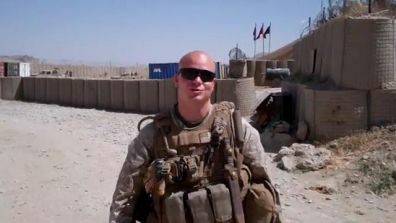 Moore said in the statement that he posted the video as part of a bet with other Marines in his unit. He sounds more than excited that the gamble paid off. Due to the immense media attention Sgt. Scott Moore has received for his YouTube Marine Corps Ball invitation to Mila Kunis and the operational tempo of 3rd Battalion, 2nd Marines, he has elected to make a written statement and answer the most commonly asked questions. Q.1 Where are you and what do you do? A.1 I currently serve as the data chief for 3rd Battalion, 2nd Marine Regiment, based out of Camp Lejeune, North Carolina. My military occupational specialty is Data Systems Technician, which is responsible for implementing and monitoring security measures for Marine Corps communication information systems networks, and ensuring that systems and personnel adhere to established security standards. My unit is located within the district of Musa Qal’eh in the Northern Helmand province of Afghanistan. Q.2 How did you come up with the idea for the video? A.2 It was kind of a bet between me and Marines in my platoon. I told everyone I was going to do it, but they didn’t think I would go through with it. One day we had a couple minutes, and I took another Marine out with me and we shot two takes. The first one was without sunglasses but I was squinting too much because it was so bright, so we shot the one I uploaded to YouTube. The rest of the Marines liked it, so I posted it that day. Q.3 When you posted the video, did you ever think you’d really get a date with Mila? A.3 I always thought I had a chance, and sometimes that’s all you need. The Marines I work with did their best to spread it around. Q.4 Why did you post the video? A.4 I wanted to take Mila Kunis to the Marine Corps ball. We all talk about what we are going to do when we get back, and this was my dream. I do feel bad for putting her on the spot, but it’s not like I was going to bump into her on the streets of Musa Qal’eh between now and the ball. Q.5 How do you feel now that you’ve made it happen? A.5 My initial reaction was disbelief. It’s going to be a great experience to meet her, and it’s going to make the ball more special for everyone. Q.6 Has Mila contacted you yet to make plans for the big day? A.6 She has not personally contacted me, but I have heard back from her people. Q.7 I understand Justin Timberlake played wingman for you. What do you think of him? A.7 JT and I had this all planned from the start. He’s been a great wingman; it’s nice to know he can get over the jealously to help a brother out (just kidding). Justin Timberlake’s encouragement definitely helped; I owe him one. Q.8 What do your fellow Marines think of all of this? A.8 High fives and positive encouragement. They’re all really excited for me. Q.9 How did you find out that she said yes? A.9 From one of my friends from back home who has been supporting me with this. He sent the e-mail to me from Fox News 411. Obviously, I shared it with everyone and we all are pretty excited for November 18th. It can’t get here soon enough. Q.10 What is the Marine Corps Ball? A.10 The Marine Corps ball is a tradition that celebrates the founding of our service in 1775. It is something that we, as Marines, look forward to every year and is a great source of pride. We celebrate this occasion with a birthday cake, a message from the commandant of the Marine Corps and other traditions. This ball will be special not only because of Mila, but also because we will have recently returned from our deployment to Afghanistan. Q.11 Has your family heard, what do they think? A.11 My family heard and have received a lot of attention back home. They’re really excited for me, and my dad said he can’t wipe the smile off his face. Q.12 Is there any type of statement or other reactions you’d like to note? A.12 I would like to thank all my friends and family back home in Grove City, Pennsylvania, and all my Marine brothers in 3rd Battalion, 2nd Marines, for helping spread this around. It’s a great opportunity and I cannot thank everyone enough. Q.13 Do you have any special plans for the ball or does this change what you normally would do for a Marine Corps ball? A.13 I think I’ll keep that a secret for now; we have to iron out the details. For the most part it will be a normal experience for those who have attended Marine Corps Balls in the past. Q.14 What can Mila expect to see at the ball? This is Sgt. Scott Moore’s second combat deployment. He is a veteran of Operation Iraqi Freedom, where he served from April to October 2009. Moore is a native of Grove City, Penn. His personal awards include the Marine Corps Good Conduct Medal, and the Navy and Marine Corps Achievement Medal. He enlisted in the Marine Corps July 10, 2007. Sounds to me like Ms. Kunis is the lucky one! I agree Lynn! Ms Kunis is getting the better end of the deal! Mila has herself a winner…you gotta love a Marine that quotes Eleanor Rooseveldt! Awesome!! The logistics is going to be crazy…I can’t imagine what’s going through his mind. Who’s paying, where to eat, who’s paying for her plane ticket, where she’s staying, is he going to pick her up, and so forth. But all in all…>Well worth it! God bless them both and I hope they have a WONDERFUL time. C’mon Sgt, you GOTTA find a BAM for your wingman JT !!!!!!!!!!!!!! Thank you Sgt. Scott Moore. Finally, an uplifting story to read amid all of the negatives. I hope Mila realizes that she’s in the company of some of the best men and women in this country. My prayers and thanks go out to each and every man and woman in uniform. Where would we be without people like you? Have a great time! I am so very excited for you. Hope something special is planned for her courtesy of all the Marines attending. Make her arrival and departure memorable for her so she does not want to leave when she has to fly back out to work. You are a lucky guy and I hope you and your fellow Marines knock her socks off.